How does the Moon effect the tides? 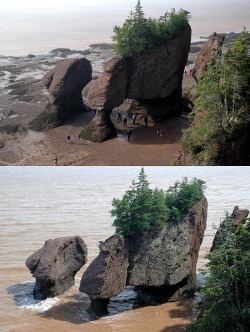 The two photos on the left are pictures of Hopewell Rocks in New Brunswick, Canada. The first photo on the top shows a low tide, where people (notice their size compared to the rocks) are invited to walk along the "ocean floor" (there's 1/2 mile or so of coast you can access at low tide). A couple hours or so before high tide, they must close off the area and make people walk up stairs to an overlook ... then the tide comes in (bottom photo, High Tide). When the photo on the bottom was taken, max high tide was still about an hour away. In this picture, you can clearly see that there are no places to walk when the high tide comes in. It is amazing to think that the gravitational force of the moon can cause the water to move like this. The tides here are quite remarkable.